Nvidia has released a major milestone in its development of the GeForce Experience graphics card companion and utility software suite. The GeForce Experience 3.0 beta version is available now and the headlining improvements include a "new fast and lightweight user interface," an integrated news stream, upgraded ShadowPlay sharing, and automated entry to Nvidia's game and hardware giveaways. Nvidia has kindly released a video walk-through of the tweaks and new features available in the GeForce Experience 3.0 beta. I've embedded that video above for your convenience. Having watched the video it concentrates rather solidly on the ShadowPlay functionality with enhanced Share Overlay UI. There's also an official blog post about the new software which reveals much more about what's new in the GeForce Experience 3.0 beta. 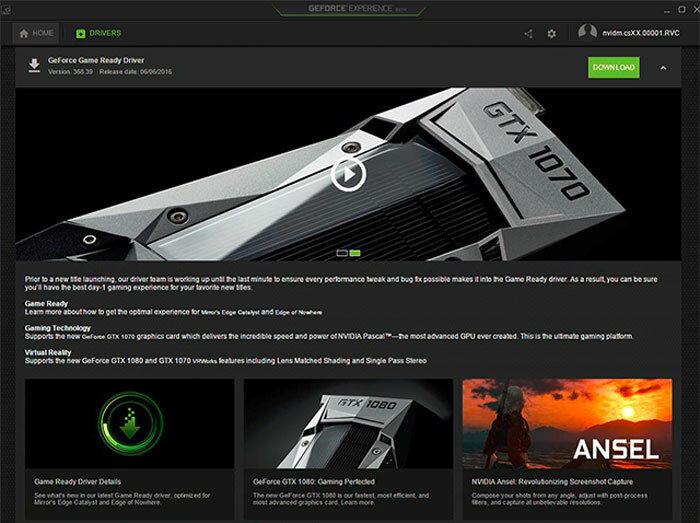 According to Nvidia, the latest GeForce Experience beta has been subject to "a top-to-bottom redesign". The changes are easy to see in the UI with it being more modern and accessible with your games, extra info, and optimal settings just one click away. Under the hood changes sound even more impressive, as Nvidia says the new beta app "uses 2X less memory and loads up to 3X faster". One of the key functions of the Nvidia GeForce Experience is driver updates. This tab now includes additional news about the latest drivers, the game ready features added, plus other news from Nvidia. Last but not least a nice feature of the latest beta is that you will become "automatically eligible for game and hardware giveaways". The same auto-log in feature will give users access to a range of new game betas, logs you into GameStream ,and more. Sweet. GeForce experience is becoming more useful. I mainly use it to set up ShadowPlay but i do also use its in-game fps counter as it's universally compatible with all games. I don't use the Game optimiser exclusively as I prefer to tweak my games manually, however it is sometimes useful to get things started when tweaking a game with a lot of different options. My biggest complaint was the time it took to load and it's memory overhead, so any improvement in these areas is very welcome. I'll install the Beta ASAP. Totally agree with that too!